NEW YORK--(BUSINESS WIRE)--Nine in 10 global cyber security and risk experts believe that cyber risk is systemic and that simultaneous attacks on multiple companies are likely in 2017, according to a study issued today by American International Group, Inc. (NYSE: AIG). More than half of survey respondents say a simultaneous attack on five to 10 companies is highly likely in the next year. More than one-third estimate the likelihood of a simultaneous attack on as many as 50 companies at greater than 50 percent. Twenty percent see an even greater threat, predicting a better than even chance that as many as 100 companies will be attacked. AIG’s survey of cyber security and risk experts was conducted to gain a deeper understanding of the likelihood and impact of a globally systemic cyber-attack. The survey follows several high profile systemic cyber events including the Dyn Denial-of-Service (DDoS) and MongoDB ransomware attacks. 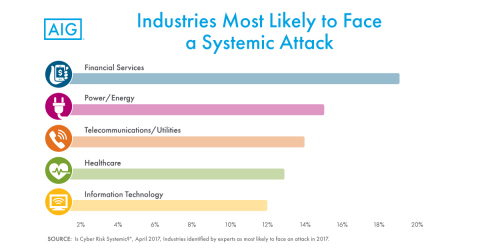 Financial networks or transaction systems, internet infrastructure, the power grid, and the healthcare system would be vulnerable in attacks on these industries. Information technology companies, including software and hardware providers that support the backbone of the digital economy, were also seen as particularly susceptible. Asked to rank specific scenarios, respondents selected a mass distributed DDoS attack on a major cloud provider as the most likely cross-sector mega event. For data theft or destruction scenarios, flaws in hardware or software widely used by the industry are most concerning. Financial Services. 15 companies breached. Mass business interruption. Mass DDoS coordinated against financial institutions. Healthcare. 10 companies breached (e.g., hospital, pharmacy, insurer). Mass data theft. Flaw in commonly used electronic medical record software. Retail/Hospitality. 25 companies breached. Mass data theft. Flaw in widely used payment processing software/hardware. Editor’s Note: In December 2016, AIG surveyed 70 cyber security, technology and insurance professionals focused on cyber risk in the United States, United Kingdom and Continental Europe to gain a deeper understanding of their views on the likelihood and impact of a systemic cyber-attack. While the sample is small, it does represent a substantial set of key thought leaders and risk management experts in the cyber risk and cyber insurance fields. Recipients included chief information security officers, technology experts, and forensic investigators as well as cyber researchers, academics, insurance-brokers, underwriters, and risk modelers. The data contained in the study is for general informational purposes only. The advice of a professional insurance broker and counsel should always be obtained before purchasing any insurance product or service. The information in the study has been compiled from sources believed to be reliable. No warranty, guarantee, or representation, either expressed or implied, is made as to the correctness or sufficiency of any representation contained therein.